Cloud services operate across national boundaries, and their success depends on access to regional and global markets. Restrictive policies that create actual or potential trade barriers will inhibit or slow the evolution of cloud computing. This section examines government procurement regimes and the existence or absence of barriers to free trade, including each country’s requirements and preferences for particular products. 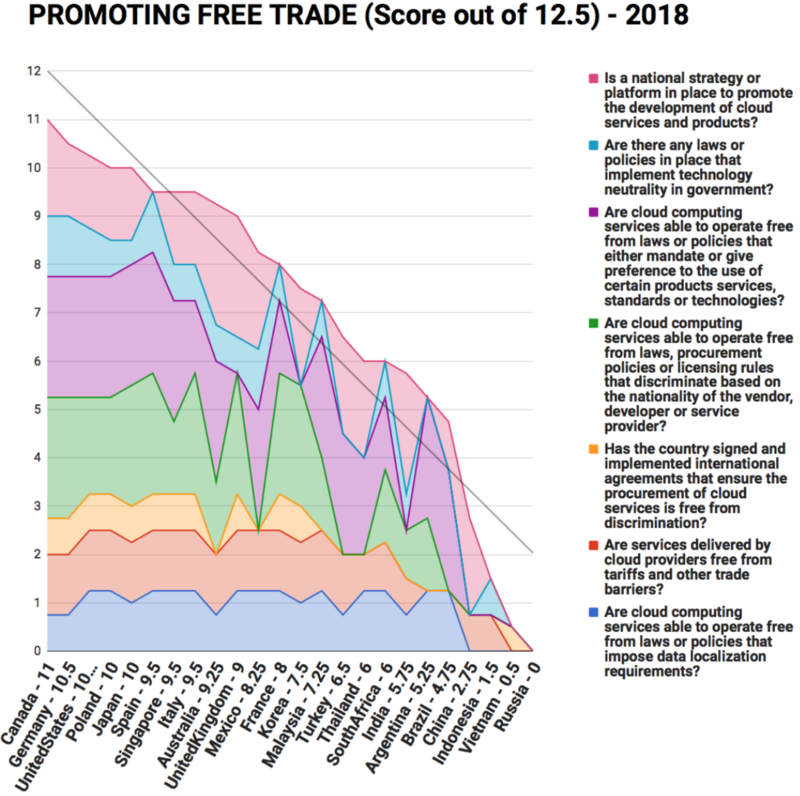 The section also examines whether countries support international efforts to standardize and liberalize trade and procurement policies, allow cloud providers to operate free from tariffs and other trade barriers, and avoid laws or policies that impose data localization requirements. The Scorecard indicates that a number of countries still provide preferential treatment for domestic suppliers in government procurement or have introduced other barriers to international trade. Indeed, this section of the Scorecard reveals the widest divergence between countries. A small group of countries scored close to the maximum points — Canada, Germany, the United States, Poland, and Japan — while a number of countries score no points or almost no points, including China, India, Vietnam, and Russia.